The Black House Spider (Badumna insignis) is a common species of Australian spider. 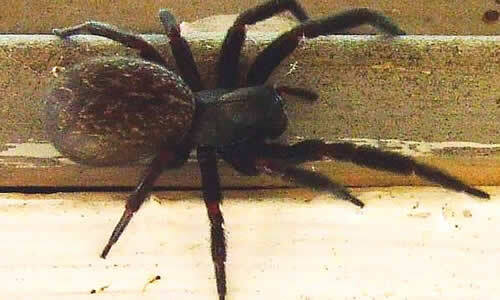 Black House Spiders live in most areas of Australia and they prefer urban habitat. Black House Spiders are sometimes referred to as ‘Window Spiders‘. These spiders belong to the family Desidae along with the Grey House Spider (Badumna longinquus). 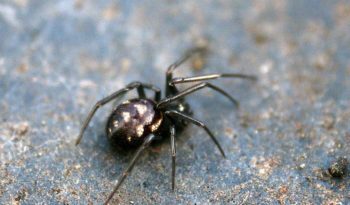 The Black House Spider (Badumna insignis) is a dark coloured, robust spider. The female of the species measures up to 18 millimetres and is larger than the male which measures up to 9 millimetres. The carapace, the part of the exoskeleton that covers the cephalothorax (the first anterior major body section) and legs are dark brown to black and the abdomen is charcoal grey with a dorsal pattern of white markings. Black House spiders are commonly found by home-owners in window framing, under leaves, gutters, in brickwork and among rocks and bark. 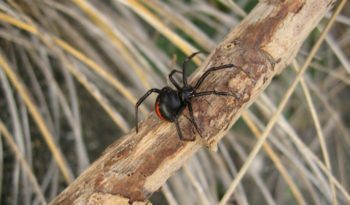 In the Australian bush, Black House spiders are usually found upon rough-barked trees which provide good shelter for their retreats among the cracks in the bark. The web of the Black House Spider has a ‘funnel-like’ shape, which is sometimes misunderstood as a Funnel-web Spider web. Their web is a messy-looking construction of triangular sail-like shapes, usually found stretched in the corner of the walls and windows. Somewhere in the web is a funnel-shaped entrance to the nest, where the spider spends most of its time, waiting for prey. The female Black House spider never leaves her web unless forced to and continuously repairs it. Old webs can look grey and woolly from constant additions of silk. Males, when ready to mate, go in search of females in their webs. Black House spiders particularly like trees that have been attacked by wood-boring insects, as the sap flowing from the bored holes attracts flies, beetles, butterflies, bees and ants, which the spider can prey upon easily. In the house, Black House spiders feed upon household pests attracted to the light of windows and lamps, where the spiders tend to build their webs. Electric lights attract their other prey which also includes moths and mosquitoes. When the male Black House spider finds a female in their webs, the male plucks the web of the female to attract her attention. Once the male has made sure that the female will be receptive, he can safely approach and inseminate her with his palps. They may then stay together for several days and may mate again several times. The female Black House spider constructs several white silk egg sacs, which are secured within the web retreat. The female stays with the eggs until they hatch. The spiderlings then disperse. 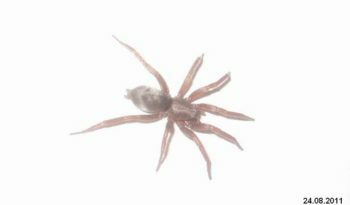 The spiders mature during summertime and live for about two years. 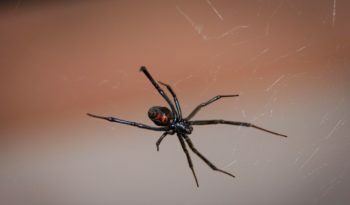 The Black House spider is venomous, however, it is not considered dangerous to humans, except for possible infection of the bite. Black House Spiders are quite shy, only coming out of the nest to capture their prey, then quickly retreating. 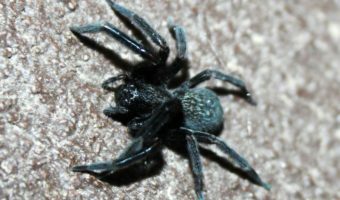 A Black House Spiders bite may be quite painful and cause local swelling. Symptoms such as nausea, vomiting, sweating and giddiness are occasionally recorded. In a few cases skin lesions (Necrotising Arachnidism) have developed after multiple bites.